Azure blue sea, endless sandy beaches, sunbathe and relax under palmtrees, interesting culture, charming villages and excellent cuisine. So, you still want to go without your beloved hobby, Golf? If you choose a car hire in Malaga, you will be able to enjoy this sport along the many golf courses of Costa del Sol, also known as Costa del Golf, and why not, enjoy a pleasant drive on the coastal roads with the beautiful landscapes views of Malaga. The Costa del Sol in Malaga offers enthusiastic golfers a wide variety of for a perfect holiday. The variety of golf courses in Malaga is great; some are recent and others established several years ago, such as the Club de Golf Parador, established in 1925, propelled by the royalty of England, for players of all levels, old or young. 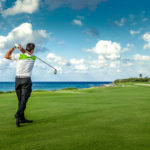 One advantage is that the golf resorts are situated in the immediate vicinity; thus ambitious golfers have the chance to try out different courses of varying difficulty. Some of the additional attractions are for instance the obstacles or water hazards and vegetation, artificial illumination for night play, artificial lakes and streams; all were developed ​​by great designers like the renowned Gary Player. The Costa del Sol is furthermore host for a large number of tournaments, fairs and festivals held each year. Malaga’s natural beauty and the particular topography of its landscape of Malaga provide the ideal ingredient for the sport as it implies an additional challenge for the golfer to enjoy the great opportunities that allows you to develop your game. Getting to Malaga is easy and convenient. 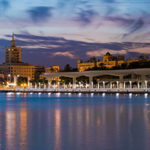 Due to the good infrastructure, the region offers its guests the international airport of Malaga Costa del Sol. The flight time is between 2 and 3 hours. If you like golf, you surely must travel to the Costa del Sol, as it is currently one of the best golfing destinations in Europe and also one of the most attractive tourist destinations in Spain. Remember to check our prices for Malaga car hire, there are many golf courses in Malaga and distances are not short.